THE SANDMAN UNIVERSE #1 provides a welcome return to longtime fans while offering a compelling reason for first time readers to enter its world of damaged dreams. There are a few comics that are spoken of in hushed tones, ones that get called seminal, and when you're entering comics fandom for the first time, will likely be recommended to you at every possible chance. Neil Gaiman's THE SANDMAN is one of those books. Created alongside artists Sam Keith and Mike Dringenberg, the story was inspired by the title of a classic DC comic even though the titular Sandman—more regularly referred to as Morpheus or simply, Dream—was an entirely new creation. Now, 30 years after The Sandman’s debut, after 75 issues and legendary storylines like “The Doll’s House” and “Season of Mists,” and the recent prequel, THE SANDMAN: OVERTURE, Vertigo and Neil Gaiman have teamed up again to bring us THE SANDMAN UNIVERSE #1. An introduction to four brand new ongoing series based in the world of The Sandman, the first issue takes readers on a journey through spaces beyond the Dreaming. If you're a fan who already loves the dense, complex, and often dark world of Sandman, then you'll find a whole new set of characters and landscapes to love with hints of the familiar. But if you have yet to discover the Dreaming and the Endless—or may have even been afraid to jump into the esoteric and expansive world of The Sandman—this new issue is the perfect place for you to step into the fantastical world that fans have loved for 30 years. The Sandman Universe #1 consists of four intertwined stories that give us a glimpse of both familiar and new realities cleverly introduced by curator Neil Gaiman and the creative teams: THE DREAMING by Si Spurrier and Bilquis Evely, BOOKS OF MAGIC by Kat Howard and Tom Fowler, HOUSE OF WHISPERS by Nalo Hopkinson and Dominike "Domo" Stanton, and LUCIFER by Dan Watters with Max and Sebastian Fiumara. Colorist Mat Lopes submerges us in a beautiful fairy tale splash page as we open the book, promising a world that's brilliantly colorful and vibrantly different than what's come before. This is the land where gods are born. It is The Dreaming, and it has been thrown into chaos. 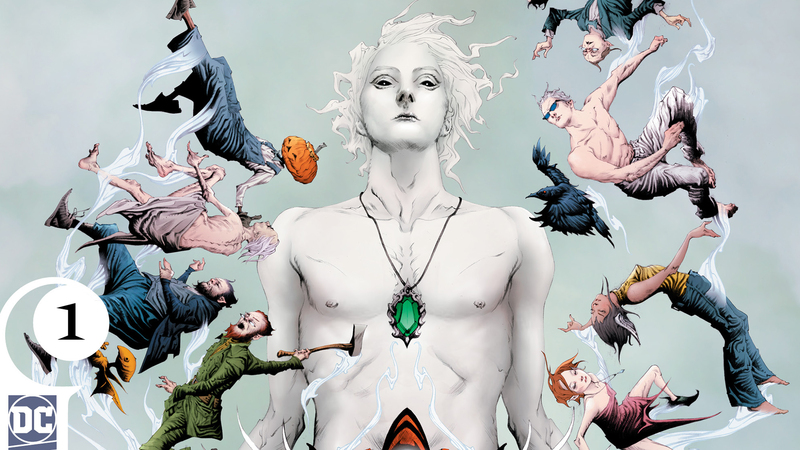 Where previous Sandman stories have been steeped in lore and context that new readers may not have had a handle on, The Sandman Universe eases us into a fresh and frenetic landscape with characters and settings fans will instantly know, but that new readers don't have to decipher to enjoy. Our guide through this strange new space is Matthew, who eagle eyed lovers of Dream will know as The Raven of the Dreaming, a winged messenger imbued with the soul of a man. As he flits between pages and stories, we're allowed to see snippets of this ever growing universe—from the rapidly declining Dreaming in desperate need of its master, to a powerful and troubled young boy facing unknown danger, through the lush greens of New Orleans where an alligator god stands tall in a top hat, and all the way down to the depths of a dead world where a strange young man named Lucifer is trapped. A vital theme of the original Sandman series was the inevitability of change, and how for things to change, we must grow, evolve, or sometimes even die. The tales woven inside The Sandman Universe #1 expand on that core tenant. The Dreaming is faced with physical ruin due the choices of the man who's supposed to protect it. A familiar child stares down a fate that pits him against himself, fighting to become either the most powerful or most destructive wizard on Earth. A new house now stands aside Mystery and Secrets, which in itself is strange enough, but when the Goddess who runs it sees four young mortal women speak of a strange book, the world could be irrevocably altered. And an ancient man-child striving to do the right thing is held hostage by his own mistakes. The Sandman Universe #1 is a sumptuous experience with each tale uniquely beautiful and appropriate. With sequential storytelling that excels in both tone and talent, each artist creates a space that's different from what we've seen before, spanning the spectrum between high fantasy, realism, and even the abstract. Once you step into this Sandman universe you never lose your way, though you might get lost in the immersive, sublime, and often scary worlds that they bring to life. Whether you're already a regular visitor to the Dreaming or you've never picked up a Sandman comic before, you're sure to fall in love with both the old and the new when you pick up The Sandman Universe #1. THE SANDMAN UNIVERSE #1 by Neil Gaiman, Simon Spurrier, Nalo Hopkinson, Kat Howard, Dan Watters, Bilquis Evely, Dominike "Domo" Stanton, Tom Fowler, Max Fiumara, Sebastian Fiumara and Mat Lopes is now available in print and as a digital download. Rosie Knight writes about Young Adult comics and the DC Universe in general for DCComics.com. Be sure to follow her on Twitter at @RosieMarx.